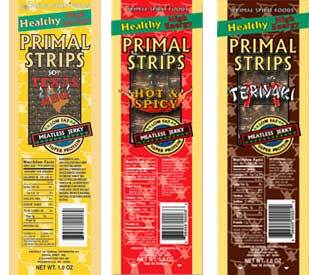 So the other day my boyfriend purchased a “Primal Strip”. For those of you who dont know it is a vegan form of “beef” jerky made with textured soy. I was curious to see what it was about so i bit off a small piece. Within the first 5 seconds it was in my mouth it was spit out the window onto the highway. It felt like I had animal flesh in my mouth. I had this eerie grotesque feeling come over me like I had just bit into an animal. I couldnt believe vegans/vegetarians ate this. I guess what I quite dont understand is why as a vegan or vegetarian you would want to pretend to eat an animal? Being a raw foodist I never come across this, but most vegans and veggies eat fake meat products to imitate the real ones. Working in a health food store I see fake fish, fake chicken wings, fake beef….. If we are so against the eating of flesh why pretend to do it?? I welcome all comments, agreeing or disagreeing.